According to my mother, I work in the “mystical world of social media”—something, she says, very few in her generation understand. I remind her that her Boomer friends from high school are incredibly adept at Facebook. In fact, every time I want more likes on a picture of my quadruplet sisters, I tag my mom. Her army of Permian Panthers spring into action, commenting and liking up a storm. Despite the thundering approval her generation generously bestows upon my Facebook profile, this is not the first time I’ve heard that social media remains a mystery to a staggering percentage of the wealthiest population (important for brands, of course). Nevertheless, many of the traditional-native apparel brands my mother has long adored have made the seamless transition from catalog to web. One such brand is Seinfeld darling J. Peterman Company. Holiday sneak peek going on at jpeterman.com/sneak-peek today. 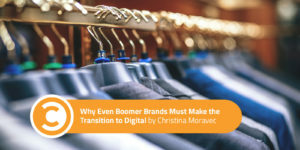 A brand’s success in the modern age is undoubtedly contingent on its ability to adapt to digital. As the holiday season approaches, we see the repercussions of this fact ever more intensely. Instagram is the new catalog, as they say (or, at least, I am saying right now). Now that brands can tag products in their images as easily as tagging other accounts, this statement is all the more realistic. That said, when it becomes apparent that a brand’s audience prefers a different platform, i.e. Facebook, the brand will likely find little success on Instagram, no matter how talented Instagram has become in supporting e-commerce. As expected for a brand with a Boomer audience, J. Peterman Company experiences much less success on Instagram. The lack of Instagram success could be due to a lack of quality strategy, photography, or storytelling. However, their lack of success is most likely a result of limited audience preference for the app. Reading through the comments, I’d never seen a brand chat so comfortably with its fans. A person is behind the account—better yet, a person who is allowed by management to talk like a person. Truthfully, what are brands doing on social if not building personable relationships with their customers? Time and time again, J. Peterman Company does just that. One of us was in Savannah yesterday searching for more good stuff. Snapped a photo of the back of this beautiful home…. Find out who your audience is, demographically speaking. What social platforms are they using? Let these statistics guide you in determining where efforts are best spent. A change in platform does not necessitate a change in voice or brand story. J. Peterman Company is so successful on Facebook because they have stayed true to brand. Posts are written in the iconic voice fans enjoy when perusing their traditional catalog. Respond to your audience. J. Peterman Company does an amazing job of responding to nearly every comment, no matter how trivial. In doing so, they build relationships with customers that later become brand advocates. Trust in the process. Building an audience takes time. By adding social icons to your websites and catalogs, promoting social activity through email, and publishing consistently quality content, your audience will find their way to you. Have patience. Now, no more excuses, Boomers! Get that digital train moving!